1. 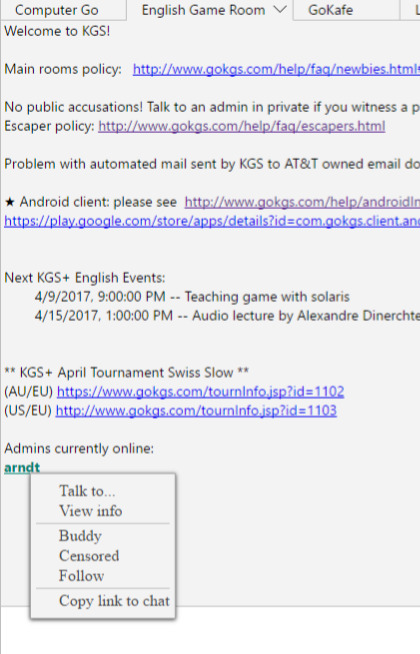 With the new version the client works through a new JSON-translator, located on gokgs.com (the old one worked through the metakgs.org translator). The ban issue has been fixed in the new translator. The system of bans now works as in a normal client. In addition, the response time of the client has become the same as in the CGoban client (if you experienced some lags while playing or reviewing games, now everything will be at the same speed as in the native client). 2. Added editing of the own info. In the window of your info was added tabs for working with the list of friends / blacklist and list, for whom you follow. 3. Added the posibility to exchange links on users and links on games in the chat. Adding links works through the context menu of the user and the context menu of the game in the list of the games (link on a game is not a permanent link, it works only while game is active on the server, but link on a user is a permanent link, that's why you can use it in your info). 1. Added a new sort type of the games (column "vs."). With this type, list of the games is sorting by the strongest player for both sides. This sort type was setted as default type. 2. In a game room nick names of the players (under the avatar) are now a clickable, when you click it the info of a player will be opened. For rengo games, nick names of all 4 players will be clickable. 3. From now you can open your own info just by click on your nickname in the upper right corner (on the left of the "Exit" button). 4. All opened challenges will be automatically closed when your game starts. 5. Fixed a problem with displaying a tab character in a user info window and in the chat. 6. The Private challenges are now supported (challenges opened in a private room are also works). 7. Fixed bug with values of komi and handicap in a challenge window, when the difference of ratings is more than 1, but the players manually set nigiri. 8. Increased the font size in the chat. 9. In the window with user info was added a checkbox "only ranked". Depending on it, either the general statistics of games or only rating games will be displayed (the field "recent games" also depends on this flag). 10. The RecentGames field has been changed. First, W and L were replaced by more standard O(win) and X(lose). In addition, all the characters are now clickable, after clicking on any of it the corresponding game will be opened. 11. Fixed bug that user couldn't start a own challenge while being in a private chat. and I have forgotten how to run it, on various platforms. Could someone ( Kirby ? ) update this table ? Thanks. The main problem with FF, that they will check my extension for months. It was funny last time when i released a new version of WGB, but FF team didn't checked my previous version. About Safari and iOS, it's hard to say. I haven't tried to make a corresponding extension. Anyway there is an idea to run GoUniverse on gokgs.com, then you will be able to use it with any browser on any OS. - Now all 4 players in a rengo game have black/white marks in the list of players in a game room. 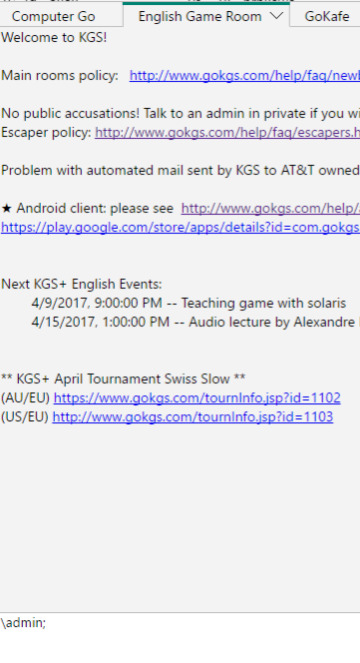 - Fixed bug with rengo game record in a user archive. - Fixed problem with clocks when the opponent added time for you. - Now user can add a time to the opponent during a match. - Added a panel with "Start review" button after end of the match. - Link to the player under his avatar in the game room now has a regular context menu. - Fixed bug with setting roles in a demonstration. - Implemented finding an admin feature in the chat room. Last edited by KOCMOHABT on Mon Apr 10, 2017 2:57 am, edited 1 time in total. Hello, the new version of GoUniverse ask me access to my browsing history, i dont understand why its needed? I've tried to reinstall extension and didn't see anything like that. Can you describe how this happens? I've reproduced that. It will be fixed in the nearest update, thank you. Is it possible to see the Open Games tab, Active Games tab, and Fan tabs? They're quite useful, but they don't seem to appear for me. Right click in the list of the games. I know it's not UI-friendly and many ppl can't find it. In the next update this will be changed and you will see normal tabs for that. Update will come in 2-3 days i hope. Nice, will GitHub have some documentation for the common features? Perhaps i will write it in my native language and ask someone rly skilled in english to translate it. But short description of the main functionality i will write by myself soon. I would suggest writing it in english and asking someone else (here?) to fix the mistakes. It's a lot easier to fix a few gramatical errors and to change a few individual words than to translate something from scratch. 1. Added tabs for the type of list of games (context menu still works). 2. Since a new line of tabs were added, i have decided to move chat tabs to the left side. It's looking rly cool now, i hope you will like it. 3. Room/private chat searching functionality was added. First of all search happens among opened rooms, but if the search string is not empty you will see two additional buttons for searching among all rooms and for trying to start private conversation with specified user. 4. Added statistics of the current room (count of the users, games, challenges). 5. Added possibility for starting an empty demonstraton (loading a file will be in the next update). 6. Added a sound when someone joins your challenge. 2. Added russian translations for GoUniverse. From now i can add any other translation, so if you miss your language and you want to add it you need to add your translation of this file https://github.com/IlyaKirillov/GoUniverse/blob/master/Src/Localizations/enUS.js. Also if you will find any errors in existing translations (currently english and russian) you can help me with improving it. 3. Many functions were added in the menu in the game room: Game info, Toggle coordinates, Crop the board. Added french translation. Thanks to Christopher Long! PS: I didn't mention versions 1.5.2-1.5.4. There were no many changes, only updates for the booklet. I already corrected the typo for Fans in the (coming) German translation. But I guess I'll better leave tabFuns as it is for now. Played two games tonight to check out the context of some phrases in the client to help me decide how to translate it best and I must say I really like the client very much!